The Mental Militia salutes Michael Boldin and his Tenth Amendment Center. A reason demonstrating why we should all support their good work is below. 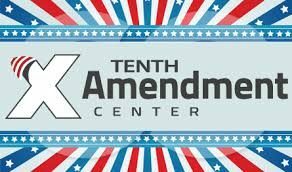 The Tenth Amendment Center sent to their list a marvelous essay in e-book form. The text of that e-book is printed below, but you can download it, with illustrations, for personal use at The Tenth Amendment Center website. The e-book treats of James Madison’s defense of his 1798 “Virginia Resolutions” as rebuttal to President Adam’s “Alien and Sedition Acts”. It includes notation of the Acts. The Naturalization Act was the first of the four laws. It passed on June 18, 1798, and extended the amount of time immigrants were required to live in the United States before becoming eligible for citizenship from five to 14 years. Unsurprisingly, supporters of the Alien and Sedition Acts took umbrage at Madison’s characterization of the laws and rushed to defend them – in effect proving Madison’s point. They turned to expansive readings of the Constitution’s general welfare clause, the necessary and proper clause, federal supremacy and the preamble to justify the expansion of power. Madison’s response in the Report of 1800 tore those arguments to shreds. But if you stop and think about it, this doesn’t make a whole lot of sense. If the founders intended to create a federal government with limited power – and they clearly did – would they really put part of the federal government in charge of defining the limits of federal powers? James Madison didn’t think so. In fact, he alluded to this principle in Federalist #10 before the Constitution was even ratified. “No man is allowed to be a judge in his own case, because his interest would certainly bias his judgment, and not improbably, corrupt his integrity.” When the Kentucky and Virginia legislatures declared the Alien and Sedition Acts unconstitutional, some supporters of these federal laws claimed the states had no authority to weigh in on issues of constitutionality. They claimed it was solely the role of the Supreme Court. Madison rejected this notion, arguing that since the states formed the Union and delegated powers to the general government to begin with, the states have a say in determining when the Constitution has been violated. He based his reasoning on the very nature of the constitutional system. “But it is objected that the judicial authority is to be regarded as the sole expositor of the Constitution, in the last resort; and it may be asked for what reason, the declaration by the General Assembly, supposing it to be theoretically true, could be required at the present day and in so solemn a manner. “On this objection it might be observed, first, that there may be instances of usurped power, which the forms of the Constitution would never draw within the control of the judicial department; secondly, that if the decision of the judiciary be raised above the authority of the sovereign parties to the Constitution, the decisions of the other departments, not carried by the forms of the Constitution before the judiciary, must be equally authoritative and final with the decisions of that department. But the proper answer to the objection is, that the resolution of the General Assembly relates to those great and extraordinary cases, in which all the forms of the Constitution may prove ineffectual against infractions dangerous to the essential rights of the parties to it. The resolution supposes that dangerous powers, not delegated, may not only be usurped and executed by the other departments, but that the judicial department also may exercise or sanction dangerous powers beyond the grant of the Constitution; and, consequently, that the ultimate right of the parties to the Constitution, to judge whether the compact has been dangerously violated, must extend to violations by one delegated authority, as well as by another; by the judiciary, as well as by the executive, or the legislature. Madison relied on the very logic of the constitutional system itself to prove the Supreme Court cannot be absolutely supreme. While the SCOTUS is the highest court in the United States federal judicial system, and has the highest judicial authority, it is not superior to the states and doesn’t possess supreme authority in the constitutional system. The notion that one branch of the federal government somehow enjoys absolute supremacy unravels the entire constitutional system. It sets the created above the creator and makes the federal government truly unlimited. The political societies that formed the union in the first place remain supreme. The court is merely an agent of those political societies. When the proverbial rubber meets the road, the people of the states always have the final say in America’s constitutional system. To say otherwise transforms it into something altogether different. Thomas Jefferson summed this up in the Kentucky Resolutions of 1798. For many people, knowledge of the Constitution begins and ends with the preamble. A lot of people even memorized it at some point in school. I suppose you could laud the educational system for at least acknowledging the existence of America’s governing document. But unfortunately, all of the focus on the preamble has done more harm than good. Most Americans reflexively assume the federal government has absolute control over immigration matters. But Madison’s response to the country’s first immigration crisis casts doubt on this idea. In fact, Madison clearly believed states exercise the primary role in controlling who is allowed within their borders. The Constitution does not expressly delegate any power to the federal government to regulate immigration. Article I Sec. 8 delegates to Congress the authority “to establish an uniform Rule of Naturalization.” But naturalization only relates to granting citizenship. when John Adams signed the three acts relating to aliens into law. While the preamble does not tell us anything about the extent of government power, it does reveal to us where that power comes from. Have you ever stopped to think about why the opening words of the U.S. Constitution – We the People – appear in large, ornate letters? It’s actually significant. When an 18th century British king issued a grant, his name always appeared at the top in the same fashion. The framers of the Constitution merely replaced the king’s name with “We the People,” signifying the sovereign authority from which the delegation of power flowed. In other words, all authority in the United States ultimately flows from the people, not the government. In the British system, the “King in Parliament” was sovereign. In practice, Parliament exercised ultimate authority with the king serving as the arm to put its power into action. The British developed a constitutional system, but not in the same sense as the Constitution for the United States. Their constitution was not written. In the British system, no distinction existed between “the constitution,” or “frame of government” and “the system of laws.” They were one and the same. Every act of Parliament was, in essence, part of the constitution. It was an absurdity to argue an act of Parliament was “unconstitutional.” Since it was sovereign, anything Parliament did was, by definition, constitutional. In the years leading up to the War for Independence, some began to question this theory of political power. Instead, they began to view a constitution as something existing above the government. The colonists ultimately rejected the idea that governments form the constitution and instead conceived of the constitution as something that binds and forms government. The written U.S. Constitution established by “we the people” reflects this shift. But “we the people” does not mean the “whole people,” singularly, nor every person in America taken together as one giant glob. The founders understood this to mean “we the people of the several states.” In fact, as originally drafted, the preamble listed every state. So why did the committee of style change the wording to simply “we the people?” Because there was no guarantee every state would ratify. Say Rhode Island decided not to join the union. It would have made no sense to have it listed if it didn’t ratify. The change in style was for that purpose, not a reflection of a change in how the framers viewed sovereignty. With the ratification of the Constitution, the states remained the preeminent political societies in the American system. As stated in the preamble, the primary purpose of the Constitution was to create “a more perfect union.” This implies the document did not create a new union, but merely built upon the existing union established by the Articles of Confederation. America’s original constitution explicitly affirmed the independence and sovereignty of the states. This basic structure carried over into the new constitution. James Madison explained this concept in his Report of 1800. In the Virginia Resolutions, Madison asserted “that the states are parties to the Constitution or compact.” By this, he meant the people of the states created the union. He further explained this idea in the Report. In a nutshell, the reasons spelled out in the preamble answer this question: why did the people of the states form a union? The answer: to establish justice, insure domestic tranquility, provide for the common defense, promote the general welfare, and secure the blessings of liberty to ourselves and our posterity. While the preamble outlines the broad objectives of the federal government, it does not confer any authority to it at all. Delegation of powers follow in the various articles. 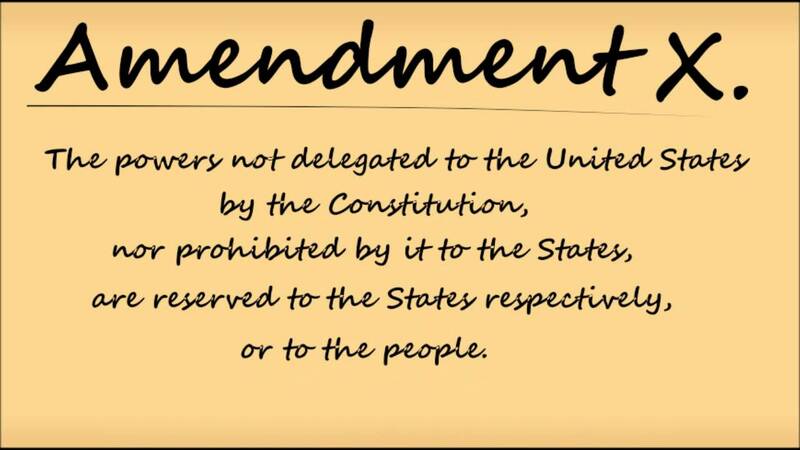 Article I, Section 8 delegates specific enumerated powers to Congress. Article II delegates specific powers to the president. Article III establishes the authority of the judiciary. Without the delegation of powers that follow, the preamble is nothing but a poetic list of objectives with no mechanism to carry them into effect. Some people began abusing the words of the preamble almost before the ink was dry. Early on, power-seekers attempting to expand the scope of federal authority argued that the preamble authorized their actions. In fact, defenders of the Alien and Sedition Acts resorted to this tactic. Madison dispensed with their arguments in the Report of 1800. The preamble is like the introduction to a book. It gives you a general idea as to what the book is about. But you would never write a book report just by reading the introduction – that is if you care about getting a decent grade. Anybody trying to justify federal actions through the words of the preamble is almost certainly expanding government power beyond its constitutional bounds. The preamble tells us a little, but it doesn’t reveal a lot. People need to keep those well-known words in their“Necessary and proper” ranks among the most abused clauses in the Constitution. It has been dubbed the “elastic clause” because of the perception that it allows the scope of federal power to expand at will. The federal government began abusing this clause within years of ratification. In fact, it was one of the justifications used to support the constitutionality of the Alien and Sedition Acts. During the ratification debates, anti-federalists warned that the central government would abuse the clause to expand power, but supporters of the Constitution swore it would not. Even Alexander Hamilton argued that necessary and proper didn’t add to the government’s power. In Federalist #33, Hamilton addressed both the necessary and proper clause and the also oftabused supremacy clause. It didn’t take long for proponents of centralized federal power to turn to the necessary and proper clause to justify unconstitutional actions. Hamilton did a 180 and used the clause to justify chartering the First Bank of the United States. A few years later, supporters of the Alien and Sedition Acts dusted off the clause and used it as well. In the Report of 1800, Madison addressed this appeal to the necessary and proper clause, ironically echoing what Hamilton had written years earlier. Madison argued that the clause does nothing to expand the powers of the general government, forcefully arguing it is not elastic at all and doesn’t give the government any additional powers. Madison went on to offer a simple 2-step process to determine the constitutionality of any federal action. If a delegated power exists authorizing the federal action, that settles the issue. Nobody argues that the federal government can’t run a post office. Article I Sec. 8 expressly authorizes this. But no delegated power is found, Madison prescribes a second step. In other words, if the federal action is absolutely necessary to carry out a power clearly spelled out in the Constitution, and it is a proper, or customary, way of doing so, then, as Madison put it, “it may be exercised by Congress. If it be not; Congress cannot exercise it. Legal documents delegating power to an agent often contain a necessary and proper clause. It has a precise legal definition that was well-understood in the founding era. In simplest terms, a necessary and proper clause authorizes an agent to exercise powers not expressly spelled out in the legal document, but necessary to execute the specific authority given to him. It serves as a kind of shorthand and eliminates the need to list every incidental power the agent can exercise. Imagine I enter into a contract with somebody to manage my grocery store. If it stipulates that she has all of the powers “necessary and proper” to running a grocery, I don’t have to to specify that she has the authority to pay a guy to clean the floors, or to hire a mechanic to fix a freezer when it goes down, or to pay the soda vendor. Those powers are proper and customary to running a grocery store. But necessary and proper powers wouldn’t give my new manager the authority to give away all of the food in my store and turn it into a hardware shop. That would not be necessary, nor would it be proper. Judges and elected officials have expanded the meaning of necessary and proper far beyond its meaning. Madison clearly argues their view was not the intent. Partisans on both the political left and right use “general welfare and common defense” to justify all kinds of federal actions, from wars to social welfare programs. Federal supremacists take the words quite literally, arguing that they authorize the federal government to do absolutely anything, as long as it furthers the general welfare or provides for the common defense – however broadly they may define those words. But this view unravels the entire constitutional structure. Time after time during the ratification process, supporters of the Constitution swore it created a government with limited powers. How can a government possessing the authority to take any action for the general welfare and common defense be considered “limited” in any sense? Supporters of the Alien and Sedition Act often justified the laws with an appeal to the the common defense and general welfare clause. But Madison asserted that the phrase “provide for the common defense and general welfare” was copied from the Articles of Confederation, and we find its meaning there. Madison expanded on this idea in his Report of 1800, and totally obliterates arguments for an expansive reading of the clause. The other questions presenting themselves, are—1. Whether indications have appeared of a design to expound certain general phrases copied from the “articles of confederation,” so as to destroy the effect of the particular enumeration explaining and limiting their meaning…In the “articles of confederation” the phrases are used as follows, in article VIII. In the existing constitution, they make the following part of section 8. This similarity in the use of these phrases in the two great federal charters, might well be considered, as rendering their meaning less liable to be misconstrued in the latter; because it will scarcely be said that in the former they were ever understood to be either a general grant of power, or to authorize the requisition or application of money by the old Congress to the common defence and general welfare, except in the cases afterwards enumerated which explained and limited their meaning; and if such was the limited meaning attached to these phrases in the very instrument revised and remodelled by the present constitution, it can never be supposed that when copied into this constitution, a different meaning ought to be attached to them. Now whether the phrases in question be construed to authorise every measure relating to the common defence and general welfare, as contended by some; or every measure only in which there might be an application of money, as suggested by the caution of others, the effect must substantially be the same, in destroying the import and force of the particular enumeration of powers, which follow these general phrases in the Constitution. For it is evident that there is not a single power whatever, which may not have some reference to the common defence, or the general welfare; nor a power of any magnitude which in its exercise does not involve or admit an application of money. The government therefore which possesses power in either one or other of these extents, is a government without the limitations formed by a particular enumeration of powers; and consequently the meaning and effect of this particular enumeration, is destroyed by the exposition given to these general phrases. The authority to deport aliens became a contentious issue in 1798 when John Adams signed the three acts relating to aliens into law. The Naturalization Act caused some controversy for political reasons, but didn’t raise any constitutional issues. Writing rules of naturalization clearly falls within the federal government’s enumerated powers. violated the Tenth Amendment by asserting power over resident aliens. Madison denied the federal government had any such authority and said it was rightly the role of a state to determine who was allowed within its own borders. Madison begins by distinguishing between alien enemies and alien friends. He admits Congress does have power over alien enemies, but denies the same authority extends to citizens of countries with which the U.S. is not at war. Here, Madison plainly asserts that Congress does not have the authority to deport noncitizens, nor does the president. He hints at this again a few paragraphs later. Supporters of the Alien Act claimed that admittance into the U.S. is a “favor,” not a “right.” As such, it can be revoked at any time. Madison said even if this were the case, it would not prove the Alien Act constitutional. Madison then addresses an argument based on the law of nations. Supporters of the Alien Act claimed aliens may be removed “at discretion, for offenses against the law of nations.” But Madison again turns to the distinction between alien enemies and alien friends. Again, Madison says the federal government does not have any authority over persons welcomed within the borders of a state. He goes on to expand on the distinction between alien friends and alien enemies even further by considering the various offenses an alien can commit. As the saying goes, the winners write the history. Even a cursory study of the ratification period confirms the people of the states ratified the Constitution based on the belief that it would create a general government with limited enumerated powers. Every supporter of ratification sold it on this premise. Even those yearning for a strong national government such as Alexander Hamilton and James Wilson argued that federal power would remain limited under the proposed constitutional system. It’s not even arguable: the Constitution was written and ratified to create a limited government, with virtually all power remaining with the states and the people. The fact that some in the founding generation almost immediately reversed course and began advocating the exact opposite doesn’t change the truth. Unfortunately, by the end of the Civil War, the supporters of a strong national government dominating the states had won. Today, the constitutional system is a shadow of its former self. The states are effectively relegated to the role of corporations with the federal government wielding almost absolute power. opportunistic pundits and politicians bastardize it in pursuit of their own agendas. Instead of basing our view of the Constitution on modern legal experts and Supreme Court opinions, we should turn to sources such as the Report of 1800. It reflects the understanding of the ratifiers, and as Madison himself argued in a letter to Henry Lee, that’s where we find the true meaning of the Constitution. The Report of 1800 isn’t a comprehensive exposition of the Constitution, but it does provide valuable insights into the sense in which it was accepted and ratified. As such, it offers valuable insight into the Constitution.